Grown at Hutchinson Farm since 1942. Available mid June - early July 2016 (with summer berries in August and September). In 1942, at the tender age of 14, John Hutchinson planted his first strawberry patch on his family farm near Maple Grove and Lakeshore in Oakville. A lot has changed since then, those strawberry fields are houses. 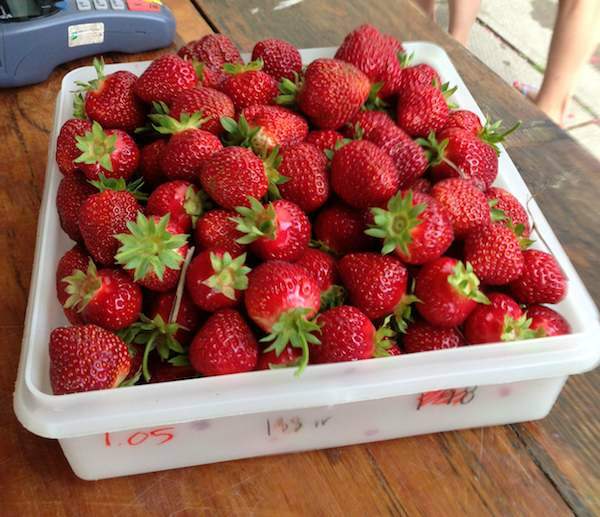 Our farm is now in north Burlington, and we continue to strive to bring you the freshest, tastiest berries possible. Every June we have lots of fresh picked berries for sale at our farm store (sorry no pick-your-own, but we do have pyo raspberries in July). Look for that fresh picked shine, size doesn't matter, avoid white tips, avoid dark purple (note, Cavendish is a dark berry). Berries picked in the hot afternoon will be soft. Consumer Alert: the green plastic berry boxes are small. The old paper boxes (which we still use, hey, we're traditionalists) hold close to 20% more berries! Also flats have been downsized (6 boxes from 8) by many growers (not us) to make them sound cheaper. Keep refrigerated, unwashed. Berries from early in the season keep very well for a few days; berries at the end of the season should be used the day they are picked.